Or serger to my American readers! At the moment I am pretty well serviced with all the equipment and tools I need to cover me for anything I am working on. This is a specalist machine used to bind raw edges of fabric with either three or four interlocking threads. It is almost always used on the internal edges of trousers or similar unlined garments. I had used one for the very first time last year when I started attending college in Hemel Hempstead. There was always a bit of a queue to use the one available, since few of us lowly students had one at home, so the chance to tidy up a work-in-progress was keenly took. 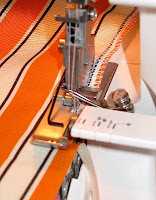 The times I would have had need of an overlocker, I always made do with bias binding any raw edges, but having had the chance to use one I could see it really was the right tool for the job and something I needed to look into. So buying one had been in my sights for a while now, though often priced at £400 plus, it wouldn’t be anytime soon. That said I thought it was worth looking around and keep an eye open for what’s available. The first place I’d seriously look for somethime like this is always John Lewis as they are rarely beaten on price and have superior customer service and after sales care. We were passing the Welwyn Gadren City branch recently so we popped in to take a look. As ever they had more than one model in stock, one of which was £399 as I expected, but the other was only £199 - and was a similar design to one I had used at college (see above). I couldn’t believe my luck, so snapped it up before I could talk myself out of it. One of my main concerns was the warrenty, which I wanted to be as long as possible as if anything went wrong with it I would not know where to begin with fixing it - it’s not like my trusty Singer after all. Reading the blurb for it I found it came with a 2-year manufacturer’s warranty, with an option to extend it to five – which was a relief. At the time or purchase I didn’t have a specific project that I had need of use for it, which was not entirely a bad thing. If I’d ploughed into a live job and not been competent at using it I could have made a hash of it. Instead I set about making something I had thought of doing but never gotten around to. In my sewing room I have various rolls of fabrics propped up against the wall behind my door. I was always worried of them gathering dust or possibly fading with sunlight as I sometimes have the bad habit of leaving them close to my window. What I needed was some covers for them. They did not need to entirely seal the rolls up, but at least cover the bulk of them to give them protection. Cutting a long story short, I made what I needed from calico, overlocking the raw edges and sewing the long seam in the same stitch. They would all now be cover in the same fabric, making it hard to distinguish one from another, so I made a swatch tag that is attached to the tops of the bags, the edges of which, you guessed it, were overlocked too (see right). Basically I made the entire bags with overlock stitch, giving me good practical practice in its application. The first one I did was a bit rough, but by the end I could see improvement in my ability to guide the fabric how I wanted it, making for some nice clean, crisp edges. 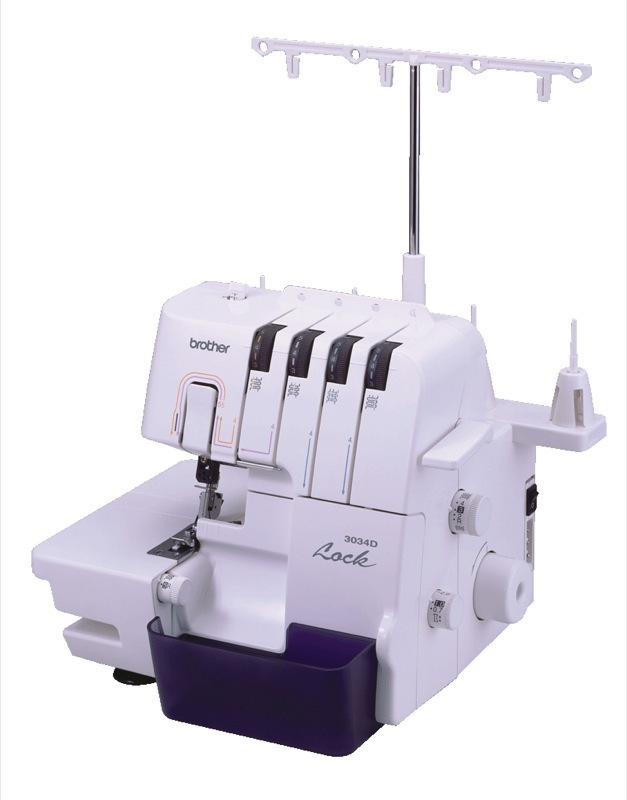 So, this week I am at last starting to use my overlocker ‘in anger’! I have a couple of pairs of Five Trousers to make, and this is an ideal opportunity to use it for the first time properly (see left). The one part of using the overlocker than needs the most concentration and skill is guiding the fabric in at the correct angle. 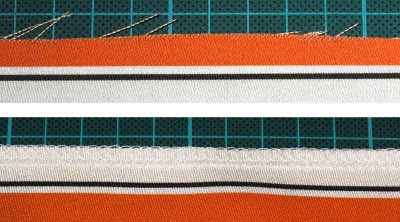 This is so the cutter, which trims the edge of the fabric to the perfect line before it gets sewn, cuts no more or less than I plan it to do. The only thing more complicated than this, is re-threading the four cottons when they run out. The machine came with a set of white reels, with a minimal amount of cotton on each. It hasn’t taken me long to get though them (apparently an overlocker will use up to seven times the amount of thread per sewn length compared to a straight stitcher). Luckily the machine comes with an instructional DVD which does not look like it has been updated since it was first issued on VHS in the 1980s! (Okay, I exaggerate, but if you watch it you’ll know what I mean). At the end of the day it is an invaluable way to remember what order to thread them and what route each takes. If you feel the need to watch how it’s done, the relevant part of the DVD is below for your enjoyment. 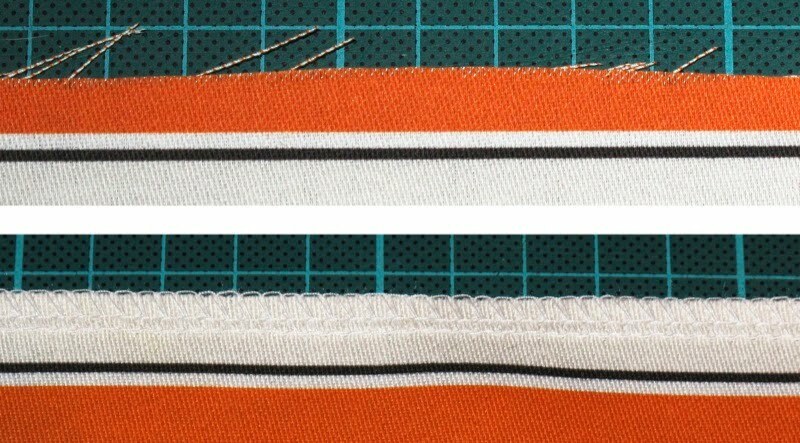 And here is the result of using the overlock, showing a before (below, top) and after (below, bottom) of the fabric edge.